Interview with The Legends of Boxing Part 1. As a boxing fan have you ever wondered what it would be like to sit down and have a conversation with some of the all time greats of boxing history? Wouldn’t it be great to ask Joe Louis how he would have done against Muhammad Ali? Or if you could talk to Jack Johnson what would you ask him? In this two part article we will have that opportunity. My inspiration came after reading a pair of newspaper “interviews” done in 1944 with Sam Langford. The sports writer didn’t ask any of the important questions about style, how he fought, what were his toughest fights, the types of things I would surely have asked. In "Interviews with the Legends of Boxing" we will ask some famous boxing personalities many of the critical questions of boxing history. The answers are based on various book and magazine articles as well as newspaper research sources. Many of the answers are actual quotes from these sources with some biographical information mixed in. This is your chance to hear from the all time greats as if they were speaking from beyond the grave. The first question I had was about the toughness of old time fighters as compared to the fighters of today. I decided to ask Kid Lavigne, world lightweight champion 1896-1899 about this. Cox’s Corner: Kid the boxing game in the late 20th and 21st centuries saw a lot of quick stoppages. For instance, in a heavyweight championship match in 2003 between Lennox Lewis and Vitaly Klitschko one of the participants was cut over the eye and they stopped the fight even though the cut fighter wanted to continue. In my time if a fighter gets knocked down and then stumbles a little when he gets up they don’t allow him to continue. There is a premium given to the safety of fighters. What are your thoughts on this? Kid Lavigne: Why such men are mere children when compared to the rough and tumble battlers of my day. They use to let ‘em rip. They didn’t coddle fighters when I fought, I imagine a lot of great victories would ne’er been won if they had. Cox’s Corner: It seems you feel that today’s fans are being cheated out of some great fights. I would say that fighters are better protected today and are spared a lot of the gore that was prevalent in your time. Tell my readers about your famous fight with Joe Walcott, the Barbados Demon (welterweight champion 1901-1904). Kid Lavigne: It was a bloody one. Walcott was a great puncher nor a doubt about that. It were pretty even the first two rounds. In the third I thought he smit me a bit low. And In the 5th round he gave me quite a tussle. He made me mad he did, and I gave him as good as I got. I nailed ‘em a good one in the 7th and thought I might have em a goin’. Then in the 8th he got me but good right in the eye and closed it. Then he really started to get to me, he hit me in the ear and it swolled up like a giant cauliflower. Blood was a squirtin everywhere. The next round he tore it open but good. My ear was torn almost off, just dangling there. We was both covered in blood, it was quite a sight. Even the hardened veterans was a screamin’ “toss in the sponge, stop the fight.” But I went back to my corner and told my manager Sam Fitzpatrick, “Patch up the ear any old way Sam, so that the blood will stop annoying me. I’m going to beat him!” Walcott gave me quite a lickin’ most thought I was whipped but good after 12 rounds but the referee wouldn’t stop the fight in those days. Then in the 13th I got him rushing in with a good right to the jaw and dropped him on his knees. He got up right away but I was really given it to him then. The next round I caught him again with a good left hook and had ‘em reelin’ against the ropes. I had em goin in the 15th too but the bell sounded. I won the decision of the referee. They said my own relative’s wouldn’ta recognized me after that scrap. My ear was hanging by a thread and I couldn’t eat solid food for a week either. In my day it was considered one of the great fights. Cox’s Corner: That sure would have been something to see. Thanks Kid. Next is my interview with Jack Johnson, heavyweight champion of the world 1908-1915. Cox’s Corner: Jack in my day there is some of skepticism about fighters of your period. Some say fighters of your day were not skilled fighters. What is your opinion of that line of thought? Jack Johnson: (feigns incredulity) In my opinion fighters of your day are a dime a dozen. Not that I want to throw cold water on fighters of your time, but in my time we had fighters who knew every angle of the game. Fighters who knew how to stand and get the best leverage for a punch and maintain balance. They knew how to take a punch. Most importantly fighters in my day knew the most important art in boxing – feinting. Cox’s Corner: It’s funny that you say that. Feinting in modern times is practically a lost art. I’ve only seen a few fighters really work at it and many of them inconsistently. The most important art in boxing yet they know nothing about it. But what about that stance that you and some masters of your era used? Front foot pointed forward and rear foot pointed out at an angle. At a glance it looks kind of strange. What can you tell my readers about it? Jack Johnson: That stance is the key to real scientific boxing. Fighters of my time had perfect balance because of that stance. Ask yourself why modern fighters cannot get perfect balance. It’s all about stance. The purpose of that stance is simply by moving the right rear foot, one can move, shift, and pivot in such away as to avoid a blow and always be in perfect position to counter with the full force of one’s body behind the blow. No jumping around for us. Take a stick and mover like Billy Conn; for instance, he can’t stay on balance with all that moving and jumping around. Men of my day like Jim Corbett, Kid McCoy, Joe Choyinski would catch him off balance and break him in half with power punches. 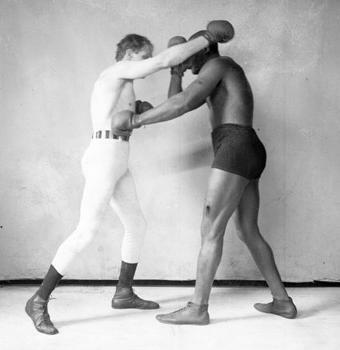 The perfect stance for boxing is what we had, it allows you to slip punches up close, take a punch better, and stay in position to punch more effectively than what I see in “modern” fighters. Cox’s Corner: That’s very interesting. There are, of course, different styles of fighting. Take a swarmer, for instance, who throws a lot of punches, a good number of men have been successful in this style and they didn’t use the old masters type of footwork. Jack Johnson: Yes but they waist so much energy that they can’t last. Look at Henry Armstrong, a good example, and nobody ever wasted energy like that boy. He reminded me of the Niagara Falls the way he used up all that energy- much of it uselessly. He was successful but only for a short time. There was no way in the world he could have lasted any longer than he did, fighting that way. I see a lot of fighters throwing wide punches nowadays too, straight shots will beat them every time. Cox’s Corner: (My Mind drifted to the Antonio Tarver- Roy Jones rematch that ended just as Johnson described. Then I brought us back to subject). But what about Jack Dempsey he was a bit of a swarmer and was a terrific hitter. Jack Johnson: Dempsey had a style all his own. He swung from side to side out of a weave and threw his whole body forward and upward. The blow would land with the whole weight of his body behind it. And he threw it fast, like a bullet. Cox’s Corner: It seems strange that some fighters can really punch and others cannot. What do you think is the secret to good punching? Jack Johnson: Balance. Guys who do a lot of running and jumping around cannot get themselves set to throw a hard punch. Benny Leonard is an exception, he moved around really well and kept his balance and that is why he was a good puncher. But most of them are not. Cox’s Corner: Who were the best punchers you ever saw? Jack Johnson: The best punchers I ever saw was Joe Walcott (the Barbados Demon –M. ), Lemme tell you, that Walcott was a killer. Sam Langford was a terrific hitter with those long arms and shoulders of his, so was Fitzsimmons. I would say those three were tops. Cox’s Corner: What about Joe Louis? Jack Johnson: Louis was a good puncher too, a tremendously powerful man. He had the powerful smooth muscles of a great puncher. But his stance was all wrong and he could be caught off balance at times. That’s why I think I could have whipped Joe when I was at my best. Cox’s Corner: You were not really considered a hard puncher yourself though were you Jack? Jack Johnson: I was waiting for that. I knocked out alot of fighters. I had more knockouts than Jack Dempsey and against better opposition in my opinion. Cox’s Corner: What was your toughest fight? Jack Johnson: My toughest fight was against myself in the days leading up to the fight with Jim Jeffries. The bitter attacks I faced were far worse than any fighter I ever faced in the ring. The caustic remarks, the threats to injure me, the shots at my character-fighting those were my toughest battle. Cox’s Corner: Thank you so much. Next up is Joe Gans lightweight champion of the world 1902-1908. Cox’s Corner: Joe many historians consider you one of the three greatest, if not the greatest lightweight of all time, nearly 100 years after your time. To what did you owe your great success as a fighter? Joe Gans: I would say I owed my success to straight hitting more than anything else. Cox’s Corner: I guess I half expected for you to say your speed or power or natural gifts. But Johnson made a similar comment about straight punching. Joe Gans: Yes, it’s very important. Careful living and correct training methods aided me a great deal, but I would say straight punching was the foundation of all my success. Cox’s Corner: But you were known for having a strong left hook as well as a straight left jab and a straight right cross. Explain to my readers what you mean by straight hitting. Joe Gans: Some fighter’s waist a lot of their energy. Wait for your opportunity and when it comes, avail yourself of it. The idea of boring in and throwing punches helter skelter without reason doesn’t amount to a row of pins. Every time you miss a swing it is worse than being hit. I could be champion until I was as old as Methuselah if all I ever fought were opponents who just rushed at me throwing wild blows. Al I would have to do is let them waist their energy and when they were weakened just land one blow, a straight one to be sure, and it would all be over in a jiffy. The point is to put your whole body behind the punch and land accurately and in the right spot. Then victory is yours. Cox’s Corner: Tell us about your famous fight with Battling Nelson in Goldfield. Joe Gans: It was September 3rd, 1906. We fought 42 rounds for my lightweight championship. Nelson and his manager Billy Nolan did everything under the Nevada Sun to try and weaken me. I had to weigh in 3 times with shoes, trunks and supporter and make 133 each time or Nelson refused to fight. Cox’s Corner: That seems very unfair. Tell us about the fight itself. Joe Gans: Nelson could absorb punishment like no one else. I gave him quite a beating. He was as game as they come. He made an ugly fight out of it, kept hitting low, elbowing and butting, and even tried to kick me once, but I paid him no mind and fought a clean fight. I hit him with some of my best punches enough to knock out an ordinary man several times. He was a glutton for punishment. I had him down twice from punches and reeling around the ring several times. I couldn’t believe he wouldn’t go down and then he would come back as fresh as a daisy the next round. I broke my right hand in the 33rd round on his hard head or I would have finished him sooner. He fouled to save himself any more of a beating. He was bleeding from the eyes, nose and ears as well as cuts on his face, I was playing for his right eye. Once I closed that, with his other eye closed too, he would have been my chicken. Cox’s Corner: The referee’s decision was met with unanimous approval according to newspaper accounts is that correct? The low blow is very plain on the film of the fight. Joe Gans: Yes, he hit way south of the border everyone could see it. Everyone at ringside cried “foul” at the time. He had been fouling through the whole fight and Referee Siler, who was a very fair man, had seen enough of it. Cox’s Corner: In my time the beating he took would never have been allowed to continue even if we had fights scheduled for longer rounds. It would probably have been stopped in the 15th round when you knocked him down and he got up unsteadily and staggered about, especially with all the damage his face had taken already. We just don’t let fighters take that kind of a beating nowadays. Joe Gans: Well ours was a finish fight and they just didn’t stop fights until a man was counted out or quit on his stool. Nelson was a tough ole boy, the toughest I ever saw. He quit when he just couldn’t take it anymore. For 42 rounds he had a rough go of it. Joe Gans: Tad Dorgan, the famous newspaperman gave me that name when I was champion. He was fond of doing that to fighters. He is the one who started using nicknames for athletes and made it popular with the public. Cox’s Corner: Thanks Joe it was a pleasure. For our next interview I decided to talk to a man who was the first real “big time” boxing promoter, Jimmy Coffroth of San Francisco. Mr. Coffroth saw a lot of great fights and fighters and is a Hall of Fame Inductee. Cox’s Corner: Jim how did you get started as a fight promoter? Jim Coffroth: Million dollar gates and the commercialism of boxing was unheard of in my day. I promoted boxing in what I believe was the pinnacle of the game. I was a boxing fan from my youth, I loved the game. I got my inspiration to become a promoter after visiting with Jim Kennedy, who promoted scraps during the Horton Law in New York. I saw one if his promotions at ringside and that was when I made the decision to go into promoting fights back on the west coast. I got a permit to stage boxing events in San Francisco from Abe Ruef, who the local political power broker. The first attraction I had was a lightweight battle between George “Elbows” McFadden and Dal Hawkins in San Francisco, that was Feb, 28, 1901. The first big fight I had was the heavyweight championship between Jim Jeffries and Gus Ruhlin later the same year. I promoted those with Kennedy and that’s how I got my start. Cox’s Corner: What were some of the other big fights you promoted? Jim Coffroth: Corbett-Jeffries, Bob Fitzsimmons-George Gardner, Battling Nelson-Joe Gans in Goldfield- that was with Tex Rickard who was unknown then, and Stanley Ketchel-Jack Johnson. I bid 100,000 dollars for the Jeffries-Johnson debacle, but Rickard outbid me with a 101,000. I retired from promoting boxing in 1929 but I made a good bit off the horse racing tracks I owned. Cox’s Corner: You saw a lot of great fights in your time, tell my readers some of them. Jim Coffroth: Oh too many to list but I saw them all from Corbett, Jeffries and Fitz to Joe Louis. I saw Dempsey annihilate Firpo at ringside and I saw Louis pummel Baer. I saw George Dixon, Stanley Ketchel, Willie Ritchie, Benny Leonard, Johnny Dundee, so many great fighters. Cox’s Corner: Who was the greatest fighter you ever saw? Jim Coffroth: I saw them come and go many times over the years but the three greatest fighters I ever saw were Bob Fitzsimmons, Joe Gans, and Abe Attell. Cox’s Corner: Give us your impressions of all three. You named Fitz first. What was he like as a fighter? Jim Coffroth: Fitz was the most murderous puncher who ever lived. He could hit with cyclonic force with either hand, from any angle and to any part of the body and annihilate his man. The men he fought were giants in comparison they were men who outbulked him, men of skill, men of might and power and tremendous strength. Yet Fitz met them and beat them. I don’t recall any man Fitz ever hit solidly when in the heyday of his career who ever was able to get up and resume fighting. No man was more lion-hearted than Fitz, none with his amazing stamina and his remarkable durability. He glorified in nothing much as a fast finish, to knock his man out as quickly as possible in every battle. He would tear into his man at the first gong and throw caution to the four winds. Cox’s Corner: And Joe Gans? Jim Coffroth: The best all around fighter I ever saw. The king of all lightweights in my opinion. Its hard to describe what an amazing and wonderful fighter he was. He was an immortal. The first time I saw him was in New York in 1900 against Dal Hawkins. It was a great fight. Hawkins had the deadliest left hook of any lightweight I ever saw. After being outboxed by Gans in the first he caught Joe flush on the point of the chin in the 2nd with his best left and Gans dropped like he was dead. I thought it was a clean knockout, when Gans got up I couldn’t believe it. Then Gans displayed some of the most beautiful ring generalship I ever witnessed to survive the round. Hawkins and the crowd both thought Gans was badly hurt and Dal would get him in the next session. But Gans had miraculous powers of recuperation. When the bell rang Gans was calm and cool and caught Hawkins rushing in and knocked him out in the third. He was something spectacular. He fought for me four times. Gans great misfortune was that he lived in the low purse days of pugilism and that he was badly managed. Cox’s Corner: Gans is one of my personal all time favorites but I am slightly surprised of your selection of Abe Attell as one of the 3 greatest fighters you ever saw. Tell us about him. Jim Coffroth: Attell was the greatest featherweight of all time. Abie was a smart fighter, a great boxer, a good puncher and game to the core. You know when I got stuck on Attell? The time he trounced the tough Bat Nelson in San Francisco. Nelson was a lightweight and as rugged as they come. It was called a draw but Attell had all the best of it. Attell was a true marvel of the ring. Cox’s Corner: I like your selections, very interesting. What was the greatest fight you ever saw at ringside? Jim Coffroth: Gans-Nelson was one of them, and Dempsey-Firpo for its sheer drama, but the best fight I ever saw was Stanley Ketchel against Joe Thomas in San Francisco. Ketchel was one of the most sensational fighters who ever lived. Today he would be a big draw because of his knockout power. But back in them days the customers wouldn’t pay to see a fighter who ended fights almost as soon as they began. A lot of guys, unless they got riled, used to carry men for that reason- it was business. The Ketchel-Thomas fight was like Dempsey-Firpo, but where that fight was only 3 minutes and 57 seconds Ketchel and Thomas fought with the same intensity for 32 rounds! They came racing out of their corner like madmen and never until the last blow was struck did either quit in the savage onslaught. I never took my eyes off that ring. I couldn’t! The sight of those men raining sledgehammer blows on each other and of both standing up when it seemed that one or both must collapse, fascinated me. Every second of every minute of the first 31 rounds I felt that the end must come. But it didn’t until after an hour and a half of the wildest fighting I had ever seen! I stood there petrified, but the crowd around me had gone crazy. The crowd was on its feet yelling and shrieking in wild delirium as the tide of the battle swept toward Ketchel, and then toward Thomas, and then back and forth again. It was a sight I couldn’t forget. Ketchel finally knocked him out in the 32nd round. Cox’s Corner: Wow that would have been awesome to see. Sometimes I see fighters of today tired after 12 rounds. Boxing fans of my time always compare how would the old-timers do now, maybe they should be asking how fighters of today would do then. Not too well I suspect. One can’t do a lot of jumping around in a 32 or 45 round fight. One last question Jim. What did you add, if anything to the fight game, in a historical sense? Jim Coffroth? I was the first fight promoter who really understood the value of publicity. I would use the press and build up the gate. I was the first to really do that. Cox’s Corner: Thanks Jim, a great interview. This ends part one of "Interview with the Legends of Boxing." Boxing Heroes and Champions. 1997. Bob Mee p 10. The quote "Why such men are mere children when compared to the rough and tumble battlers of my day" is a paraphrase of Bob Fitzsimmons. Boxing Register Roberts, James B. and Alexander G. Skutt. 2nd Ed. 1999. McBooks Press, Ithaca, NY. Chicago Record Herald 1906 Sep. 5. New York Times 1908, Feb 2. Straight Hitting Gets Boxing Plums Contains lengthy Interview with Joe Gans. Ring Magazine 1939 July. They Use To Let 'Em Rip Harvey Thorne. pp 10-11,42. Ring Magazine 1941 April. Secrets of Hitting Ted Carroll. pp 16-17, 46. Ring Magazine 1943 May. The Saga of Sunny Jim Francies Albertanti. pp 8-10. Ring Magazine 1946 July. A Champ Recalls Jack Johnson. IN The Best of the Ring. 1996. Bonus Books, Chicago. pp 99-101. Ring Magazine 1957 June. Knack for Nicknames Ted Carroll. IN The Best of the Ring. 1996. Bonus Books, Chicago. p. 172.